Summer 2006, Greece, Crete, Ierapetra. Ierapetra (meaning in Greek: Holy Stone) is located in the southeastern part of Crete and has an extremely important strategic position which controls the Cretan southern coast and the Libyan Sea. The town hosts around 13.000 inhabitants ( according to the 2001 census) and is a seaside town combined with an amazing beach exactly in its business centre. 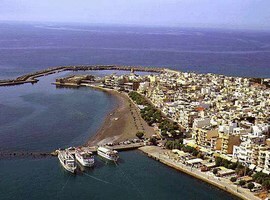 Ierapetra has always been an important financial and commercial centre of the island gifted a lot by nature. 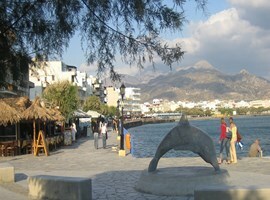 Today, it has been developed as the largest town of the southern Crete and as a major destination for incoming tourism. When someone visits it, surely he will find an active and full of people town comparing to the neighbouring towns of Sitia and Agios Nikolaos. In Ierapetra, there are many choices for accommodation of all budgets and categories as well as plenty of tourist facilities, taverns, bars and coffee shops which the most of them are placed in the local harbour. 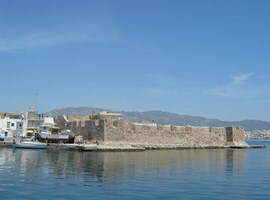 The visitors can also relish a tour with a boat to the exotic opposite island Gaidouronissi (means Donkey island). But what Ierapetra stands out of the competition? One good reason is because it has the largest number of sunny days and also the highest temperatures in the entire island of Crete and in Greece, with an average of 20 C annually! Ierapetra is a town which is rich in everything, and the only thing you will never need there is an umbrella thanks to its extremely low rate of rain falls. According to studies by experts, the mountains of Central and Western Crete work as barriers which stop the clouds before accessing Ierapetra. Ierapetra has one more quality; it is one of the most fertile areas in the Greek territory and of course one of the most productive, rich of cultivations of vegetables and fruits which are exported to numerous countries by the local farmers. The list can be much longer but we have to mention that until the last 5 years, Ierapetra was not one of the attractive or popular places in Greece, not even in Crete! However, thanks to its wonderful features, they have been many efforts to be developed. The coastal road has been reconstructed, so each one of us can travel there to enjoy a delicious lunch or a cool drink by the sea. The town of Ierapetra has quite pretty spots to explore, making you forget your stressful working days while you are relaxing in one of the beautiful surrounding beaches. The Gorge of Ha is located next to the village of Vassiliki and is considered as one of the wildest Cretan gorges as it is practically hard to reach it and only a few much experienced climbers and people with experience in the canyons can cross it successfully. Its total length is about 1 km while its entrance is extremely narrow and opens only on the top. The width of the gorge sometimes is only 30cm while its widest point is 3m. Small lakes and waterfalls composed the amazing interior part of the gorge. However, if someone would try to cross it with no use of the necessary equipment and experience, it could be really fatal. The area around and inside the Gorge of Ha is a habitat for the wildlife; a naturally protected home to rare species of fauna and flora. 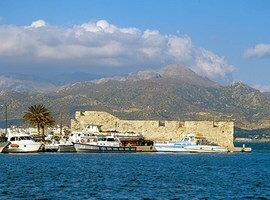 Kales Fortress is a distinctive characteristic of the town of Ierapetra. According to a local myth, the fortress was built in 1212 by a pirate from Genova whom his name was Pescatore and made it a start point for his pirate campaigns. 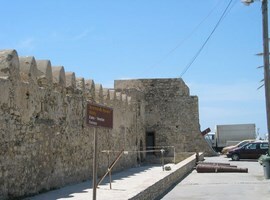 The fortress was built on the northern sea wall of the port for looking out for unfriendly ships and protecting the harbour from the Arab pirates. It’s possible that the castle have been built on the remains of an older fortress. The fortress of Kales is a great monument for its time. 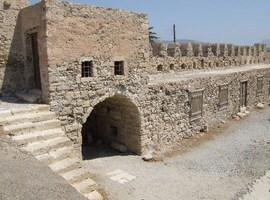 Its massive structure which was quite simple, was made of stones without many decorations or other showy displays. 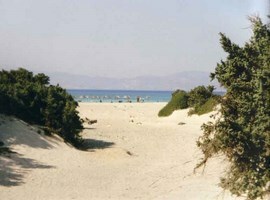 Koutsounari beach is located 5km away from the town and is a large beach with fine golden sand and emerald shallow waters. It is not fully organised, which means that a quite large part has no umbrellas and sunbeds but there are a few trees providing their cool shade for the bathers. 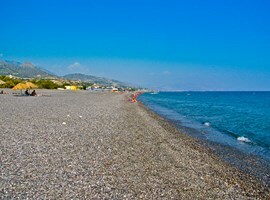 This beach is maybe the most beautiful of the area and is located 10km at the west of Ierapetra. The waters have a unique aquamarine colour and the coast is covered by small white pebbles creating an exotic landscape. Myrtos is an ideal place for families while attracts a great number of European tourists. It is fully organized and quite busy. 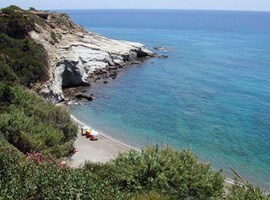 Other nice beaches are the Agia Fotia and Ferma which offer beautiful scenery combined with clear sea. The town is the ideal destination for those who want to spend their holidays in an active tourist resort, with interesting nightlife and many choices for activities. It is ideal for holidays for young people and couples who want to combine at the lovely and romantic beach with a full of life town while can have some opportunities for excursions. It is also ideal also for families as in the area there are many hotels and many facilities which can cover all the needs. Holidays in Ierapetra are finally ideal for those who want to explore the Southern Crete and the beauty of the Libyan Sea; all these combined with the wonderful gorges, the picturesque villages and the clean beaches.